Kids are back in school, and on this cold wintry day I sit in quiet with the sun streaming in. I feel open and thankful. Last night I was feeling constriction around school starting, and the holiday being over--moving back into the daily grind, devoid of the magic of the holiday season. I also felt the mess of the piled up dishes and the clutter of the girls' things all over the house. I saw the Christmas tree needing to come down that looked out of place now that it was the 2nd of Jan. I felt myself walking through the house with a familiar dread and anxiety, aimless, not knowing where to begin--stressed out. When my daughter got bit by her hamster, I felt myself wanting to shut up her loud wailing, instead of comfort her. I felt myself wanting to shout at her I told you so, when she began shouting that the hamster was going back to the store. It was time to get real with the pain. "Shelley," I said, "I need you to help me release on the fact that the holiday is ending, and the daily grind sets in tomorrow, the magic of the holidays is gone, and I am afraid that it will ravel me up into a tight ball of constriction, and I'll lose the flow and the sweetness, and that it will feel hard. I don't want to feel like my well-being is continually in competition with the schedule, and I don't want to feel drained, stressed out and pulled in all directions, mad at myself and mad at the kids, and mad at life." We laughed at my thoroughness. She asked me if I could welcome my sense that the daily grind is kicking in and that it is going to make me suffer. I said "NO, I can't welcome it." She said, "can you be okay with being unable to welcome it?" I said no, because I really wanted to be able to welcome it, but it was squeezing all the life out of me. It is hard to welcome the squeezing. She asked me if I could welcome the sense that I believe that it is going to be hard. I said no. I couldn't welcome it, because I didn't want to believe that it was going to be hard. She asked me if I could welcome my resistance, my wanting to push it away and pull it closer. I thought about it for a moment, felt my inner commitment to letting go, and said yes. She asked me if I could, in just this moment, let go of needing it to be hard, and anticipating difficulty in the future. This made me laugh/cry, always the sign of release. It always makes me laugh when I finally realize that I have braced myself for the worst case scenario. I said " yes," and my mind added, "just for this moment." She said that I could have my pain and resistance back after letting go of it for a moment. This always makes me laugh, how much I find I want to hold onto the pain, how hard it is to let it go. It makes me think of keeping a dead and rotting cat, and holding it and petting it, like you'd see a mental patient doing in the movies, just because they can't let go of it and bury it already. EWWW. My wise friend said, "can you open to the possibility that this time can be just as magical as the holidays, even more? "Can you feel into that yes a little more?" I felt a mixture of appreciation and weightlessness, and a little mistiness in the eye region. And the paralysis that had set in gave way. I found my ability to comfort my traumatized bitten daughter. I picked up two of my favorite fun children's stories off the bookshelf, and gathered the girls on the couch. They snuggled up to me in their soft pink jammies and we read in the glow of the Christmas tree, which had somehow regained all its splendor. We sang in Row Row Row Your Boat in rounds, and played a game where we held hands and then shared the first image that came to us. I thought of hamsters making valentines, my youngest thought of our living room full of butterflies, and my oldest thought of her bedroom bedecked in Webkinz (stuffed animals with a virtual life online), including a giant Webkinz cat bed, and a turtle desk. I thought that sounded interesting. There was my magic, and, yet, the holidays were over. Since then, I received an arbitrary email in my inbox saying that this month would be my most magical one ever. I find myself sitting here knowing that my girls got the best of me, their warm and toasty breakfast, and the little extra love I showed as I gathered their backpacks and bundled them up in coats, hats, and mittens. And on the way to school, I was able to extend the possibility of release to my daughter who was anxious about the seating arrangement in her classroom that would be different. I asked her if she could open to the possibility, that no matter what, it could be better than perfect. I asked her if she could open to the possibility that no matter what it looked like it would be for the best. And my heart felt warm when she said a simple yes, then proceeded to chat amicably about the different possibilities of kids that she could sit by, how she'd already sat next to some of the most annoying of the bunch, so her chances were good she could like it! So, here I am basking in the bliss of an ordinary January 3rd, down a road of possibilities that didn't seem possible before I released my fear and opened to the truth my heart knows--that release is what opens up a doorway to a new kind of experience, and leads you joyfully through it, and all it takes is a willingness to find a way to feel better. I've since decided that I am instituting a new ritual about taking the Christmas decorations down this year. I think it will include Harry Connick Jr, dancing, lighting candles, reminiscing about the meaningful holiday moments, and daydreaming about the year to come! I feel the release. I will come back to this post again & again. It's like a deep, full breath. Letting go, letting things be and letting love lead the way. Bravo girl. 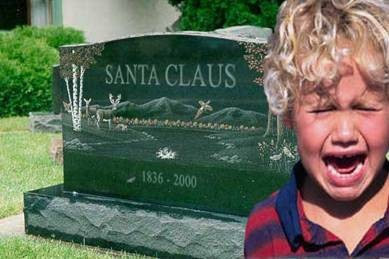 Wherever did you get that Santa tombstone picture? Love it. Thank you for including all the inner and outer dialogue in the release process. I need to ask myself those questions. I appreciate your honesty about all the nos before you got to yes. I am not there yet in my process, but your story gives me hope that I will be. I, too, will revisit this magical post. 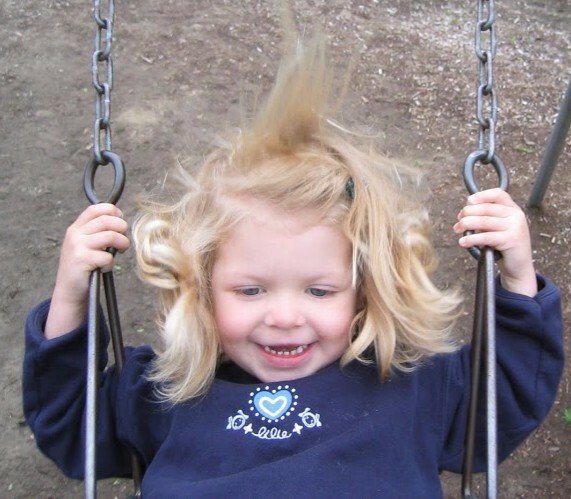 When I read your writing Brooke, I am struck by what an amazing mother you are to your girls. It truly sounds like they get the best of you, and that makes my heart sing. Yet another beautiful blog post... letting All That Is, simply Be.